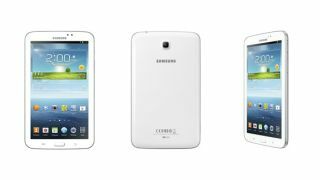 The third iteration of Samsung's Android tablet is finally here, with the announcement that the Android 4.1-running Galaxy Tab 3 will be arriving from May. Making the announcement via its website, Samsung revealed everything we can expect from its 7-inch tablet, which will be powered by a dual core 1.2GHz chip and comes with either 8GB or 16GB of storage - or up to 64GB if you choose to expand via the microSD slot. While the tablet's design pitches it as competition for the iPad Mini and the Nexus 7, its 1,024 x 600 resolution display is a little disappointing at only 169ppi. But don't forget that we're also expecting the imminent arrival of the 10-inch Galaxy Tab 3 Plus, which is rumoured to be packing a more impressive 1.GHz dual-core processor and 2,560 x 1,600 resolution display. The WiFi version of the Galaxy Tab 3 will be available worldwide starting in May, with the 3G version following in June.